20 TRADERS LANE, 117 Andersons & McCormack St, Purple Shop, Brothers League side. /B> Heaps of Parking available. We do understand, however, that certain customers who live outside of the Cairns area may find it difficult to visit during these hours. Please contact us if you wish to visit our store outside of these hours and we will try our best to accommodate you. •Dressmaking,Childrenswear, Eveningwear, Casualwear, Corporate Uniforms, Costumes, Dancewear, Sarongs & Beachwear, Protective Clothing, Weddings and clothes for any ocassion. •Sheeting, Quilting, Curtaining, Upholstery, Seat Covers, Back-Drops for Stage,Tablecloths, Cushions, Pillowcases, Blankets, Bed Covers and Bed Sheets, Cot Covers, Quilting and Embroidery, Dolls, Craftwork, Toweling, Curtains, Upholstery, Nets for Repelling Insects and Catching Fish, etc. 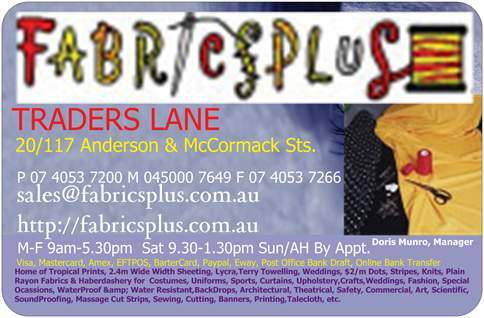 •Sewing for Personal or Commercial Purposes including Covers for Market Stalls and Displays, Bags, Shoes, Alterations and Repairs, etc. •Variety including Blankets, Manchester, Rugs, Towels, Shopping Bags, etc. The strategy is to combine selective and opportunistic buying with low overheads and to pass on the resulting benefits to the customer. This allows clubs and even homebuyers to consolidate their orders and enjoy savings in freight with no charge for shipping within Australia for orders over $100.00. We also provide the opportunity for independent resellers to purchase volumes of product at our Wholesale Pricing so that they only need to hold stocks that they require, rather than investing in slow moving stocks. All orders will be forwarded to the customer via Australia Post or through one of our reputable shippers, depending on the order size and destination. It should also be noted that orders in excess of $100.00 in value are freight free within Australia. Orders over our minimum order value of $20.00 up to $100.00 are shipped at a charge of only $5.00 to anywhere in Australia. will make every attempt to fulfill all our Customer’s needs, it must be noted that the manner of our buying, while attempting to ensure competitive pricing, may result in limited stocks of certain products. Consequently, the range of products will be regularly updated in order to provide substitute products and a range of offers that will interest our customers. The range of products on offer on this website are further enhanced by the ranges of products sold through our retail premises. Products displayed in our virtual showroom are only a fraction of the items we have in our store. Furthermore, due to the frequent new stock arrivals, we are unable to update this listing daily. Should you have queries about items that are not on display on our site, please do not hesitate to contact us and we will be happy to assist you.